Take 3rd Exit A556 (signposted Manchester Airport) and continue straight ahead. 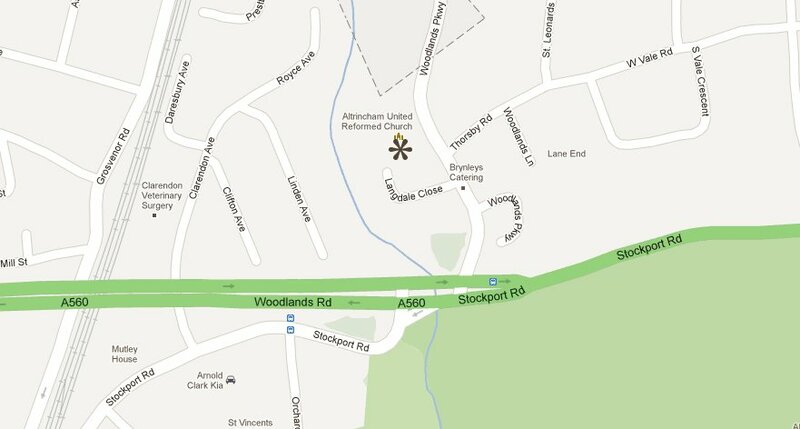 (From here it is about 8 miles to Altrincham. (Landmark - after several miles you will pass 'The Swan' Public House (Bucklow Hill) on the right). You will come to a large roundabout ( Junction 7 at M56). Take 2nd Exit towards Altrincham. Continue straight on at the next set of traffic lights. As you enter Altrincham, you will pass a petrol station on the left hand side. The road will then bend to the left. After you round the bend, you will need to get into the right hand lane. Turn right at the next set of lights into Woodlands Road (A560). (The Cresta Court Hotel is at these lights). Continue straight on over the next set of lights and onto the flyover. Turn left at the next set of lights (at the bottom of the flyover) into Woodlands Parkway. Altrincham United Reformed Church, Woodlands, Timperley, is about 50 yards along on the left hand side. Parking is available at the front of the Church and round the back of the Church. Exit at Junction 7 of the M56 and follow the signs to Altrincham on the A56. Continue straight on at the next set of traffic lights. The road will then bend to the left. As you round the bend, you will need to get into the right hand lane. Turn right at the next set of lights into Woodlands Road (The Cresta Court Hotel is at these lights). Continue straight on past the next set of lights (a Methodist Church is on the right at these lights) and uphill. Altrincham United Reformed Church, Woodlands, Timperley is about 50 yards down on the left hand side. Turn left at the level crossing, then right at the mini roundabout into Woodlands Parkway. Altrincham United Reformed Church, Woodlands, Timperley, is about 300 yards further down on the right hand side.